It had been awhile since we had any family or friends visiting from the States. The last had been my son Nick's second trip here at Christmastime in 2002. We also had a new guest room with a private bathroom that Herbert's father had built for us that we were anxious to share. We were excited that Steve and Sherry were coming and I was happy that the time went quickly as we waited for them to arrive. But, just as quickly as their arrival date came, so did their departure date. We had ten full days with them (not counting their travel days) and it just didn't seem like it was long enough. Maybe it went fast because we had so much fun with them. 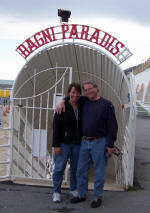 They seemed to fit right in wherever we took them and they even learned some Swiss German and were able to say things for themselves at times. (The first thing they learned was 'stange' which is a special word for a tall glass of beer.) They learned to toast like the Swiss and Sherry acclimated herself to the relatively common custom of greeting someone and saying good-bye with three cheek kisses. Actually, she seemed to enjoy this so much that her enthusiasm encouraged other people to kiss. On their first evening, we stopped by at a friend's house for a small birthday celebration. Sherry talked to one man for a while and after she kissed him good-bye, he came over to me and leaned down to where I was sitting. My first thought was, 'Whoa! What are you doing there buddy?' Then I decided to go with the flow that Sherry had started. I have to say, it was kind of nice. 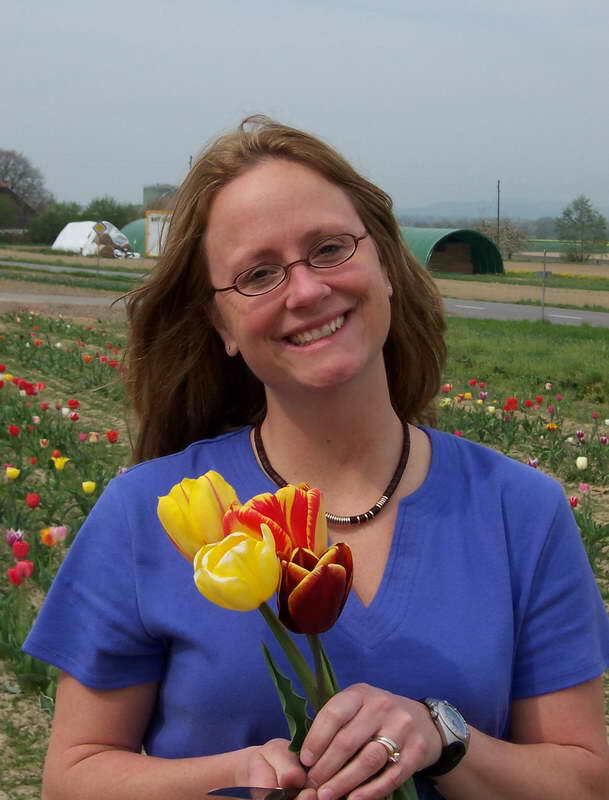 When I think about Switzerland and the customs here, I realize that this is the first time we've had visitors since I've learned to love the way of life here. And maybe this is why the time went so fast. Maybe there was so much I wanted to show them, so much I wanted them to experience and so much that I wanted them to understand about life here. Hopefully Herbert and I were able to do that. 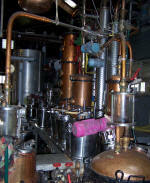 In our effort to give them all of this, Herbert and I kept them very busy. We showed them around our village, Oberwil, including the cheese dairy, the distillery and a hornusser game at the hornusser hut. 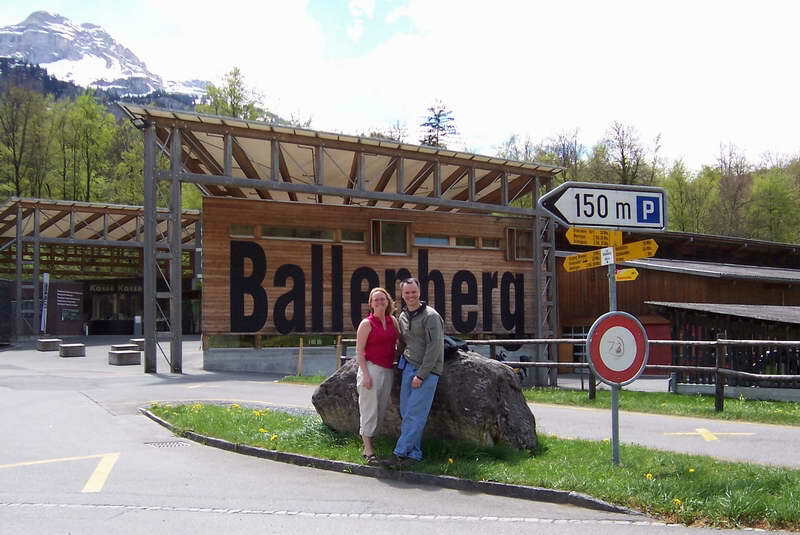 We took them to some of our favorite places in Switzerland: Ballenberg open-air museum, Kleine Scheidegg in the Alps, Interlaken, shopping in Bern, and dinner at Herbert's parents house. We took a four day road trip to Luzerne, to Bellinzona in the Italian part of Switzerland, to Florence, Italy, to Pisa, Italy, to Cinque Terre, Italy, to Menton, France, to Monte Carlo and finally to Montreux in the French part of Switzerland. This was quite a bit for ten short days. 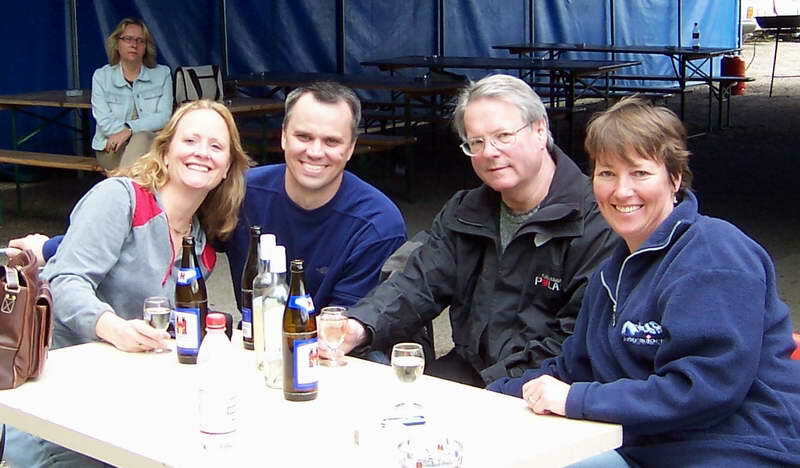 On one of their last days, we took them to the Spring market in Büren. One of our friends, Vreni, has a booth there where she sells hand-painted silk scarves. 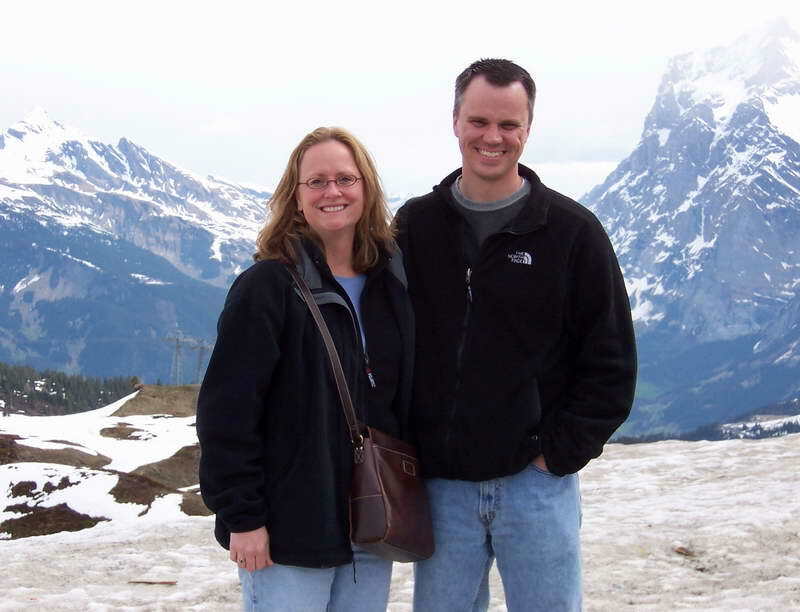 Her husband Ernst asked Sherry and Steve what they had seen since they arrived in Switzerland. Sherry looked at me as if she was trying to remember what she saw. I knew it had maybe been to much for them to process yet and I helped her out. I listed all of the things that they had seen. Ernst simply said, "You're making me tired and I'm just listening!" I understood him. No matter how busy we were, I think (I hope) that they had a great time. I also think that we were successful in making them familiar with some of the things that I, as an American, have come to know as my favorite things including the Sternen, Mädi, the card game Jass, Herbert's parents and chicken wings at the Bären, and most importantly, they got to know Herbert, who was able to take off all of the time that they were here (except for the day that they arrived). They had never met him before. 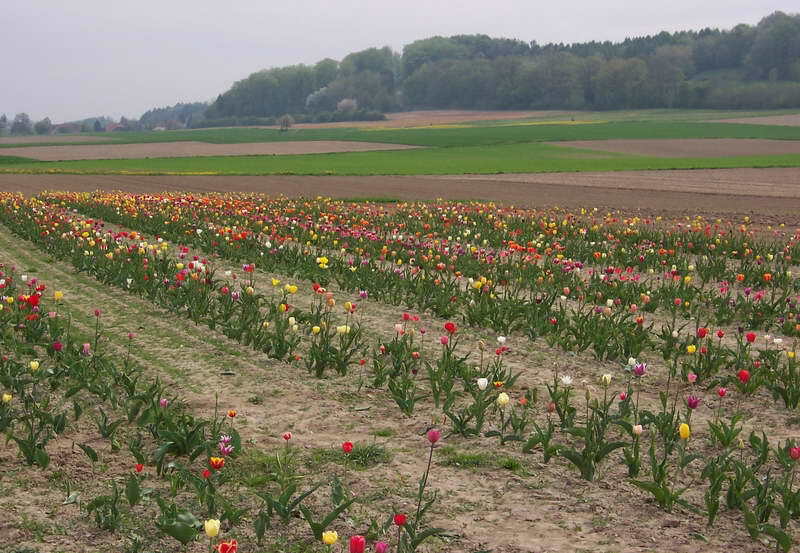 1 - Depending on the time of year, we like to take our visitors to one of the pick-your-own flower fields. 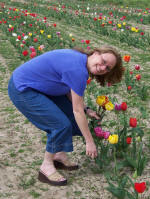 2 - Sherry picking tulips to put in their bedroom. 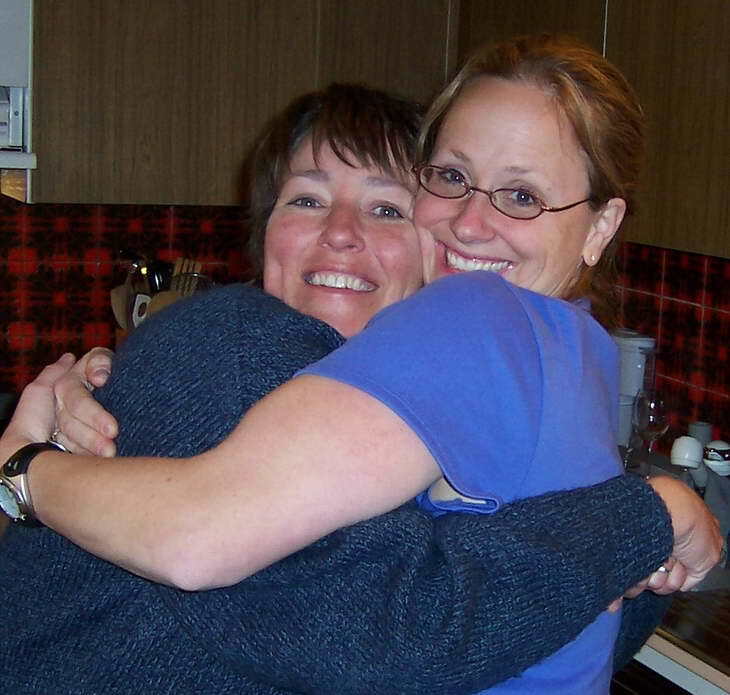 3 - Such a sweet photo of sherry, especially considering she had just traveled for many hours. 4 - I tried to keep them busy on their first day so that they wouldn't go to sleep and worsen their jet lag. We ran out of things to do by 4:00 and were still waiting for Herbert to come home from work. We decided to sit outside and drink. 5 - Herbert would prefer that this photo doesn't make it to the internet, he thinks he looks a little 'mentally challenged'. But, I like it because it shows the fact that he and Steve got along from the first evening. Besides, I've never hesitated to post an unflattering photo of myself if it helps tell the story. 6 - Me and Sherry... story enough. 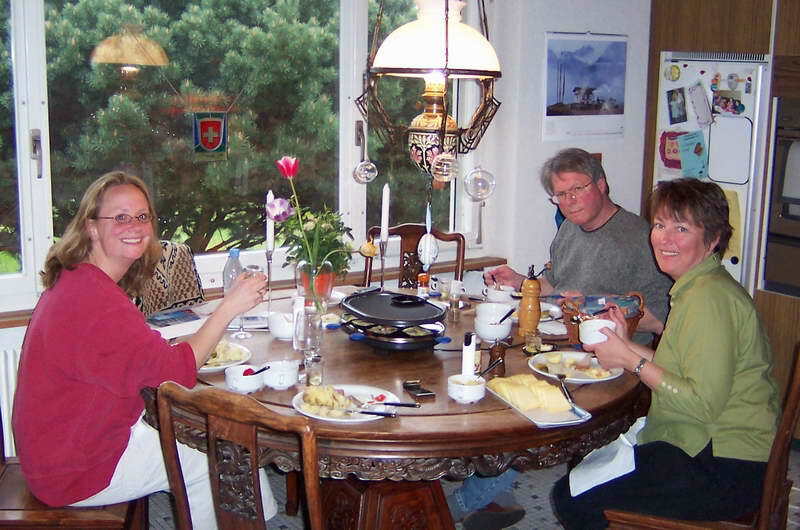 7 - Their first dinner in Switzerland. We have a special stone and everyone cooks their own food on it. Beef filet, ostrich, chicken breast, shrimp and scallops. 8 - Still the first evening. After dinner we went to a birthday party and Mädi was also there. 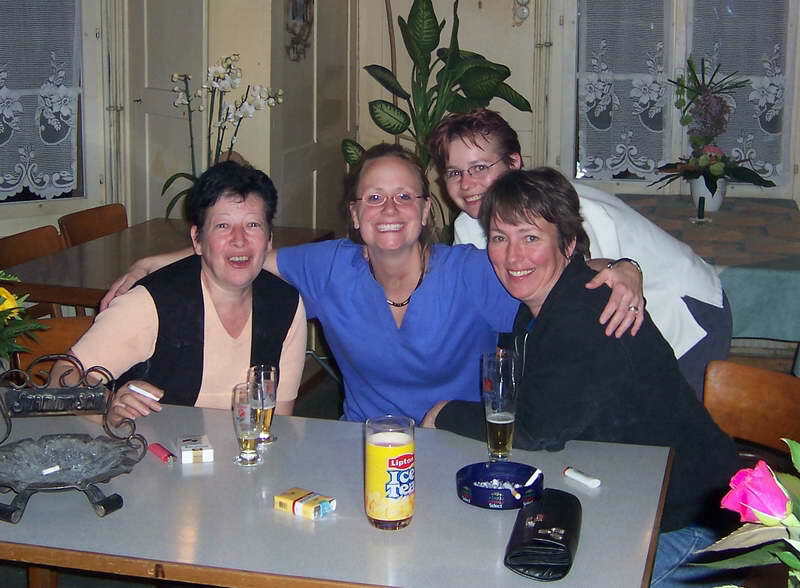 When we left, we decided to join her at her bar, the Sternen. 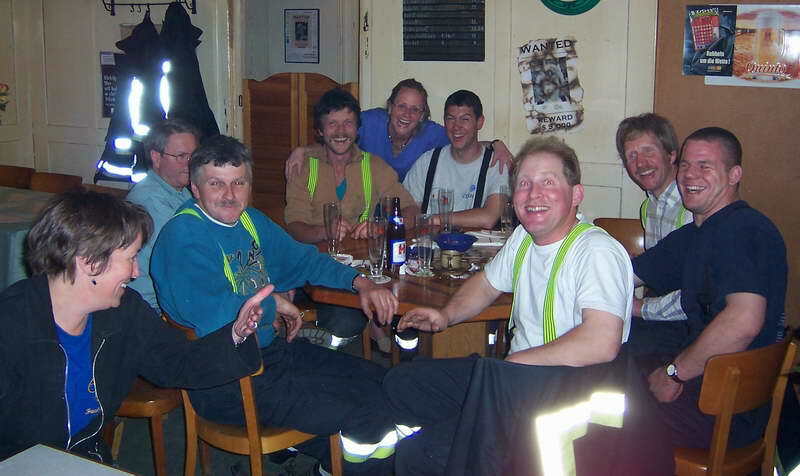 When we went in, their were six young guy sitting at the stammtisch (community table) from the fire guard. Sherry sat right down, struck up a conversation and got them all smiling. 9 - She came over to join me, Mädi and Mädi's daughter Tina for one minute - long enough to take this photo. 10 - Sherry and Steve before going into the Ballenberg open-air museum. 11 - Sherry and Steve in the doorway of one of the many houses at Ballenberg. 12 - There's one house at Ballenberg where they have traditional clothes hanging for adults and children to try on. I encouraged them to dress up and they were good sports about it. 13 - Steve trying his hand at wood carving. 14 - Sherry on the second wood carving station. 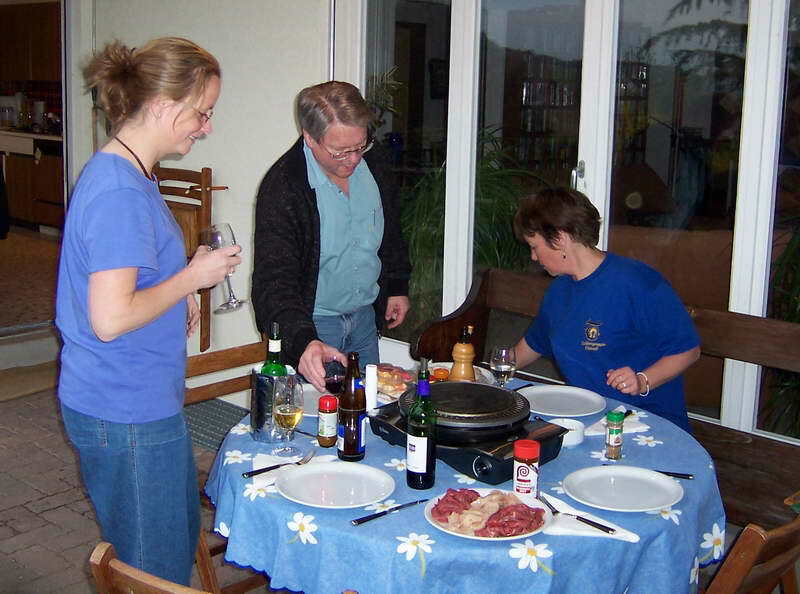 15 - After a day at Ballenberg, we went to Herbert's parents for dinner. When Frieda greeted us, I was a little surprised to see her so dressed up. For the past six months, she's been tired from a stroke. She looked so adorable that I had to take this photo. 16 - Sherry and Steve were here for the May 1st shenanigans. (If you're not familiar with this tradition in our part of Switzerland, go here.) We saw them posting the trees in the night and got up early to go to the cheese dairy and see what they took from the yards of Oberwil. 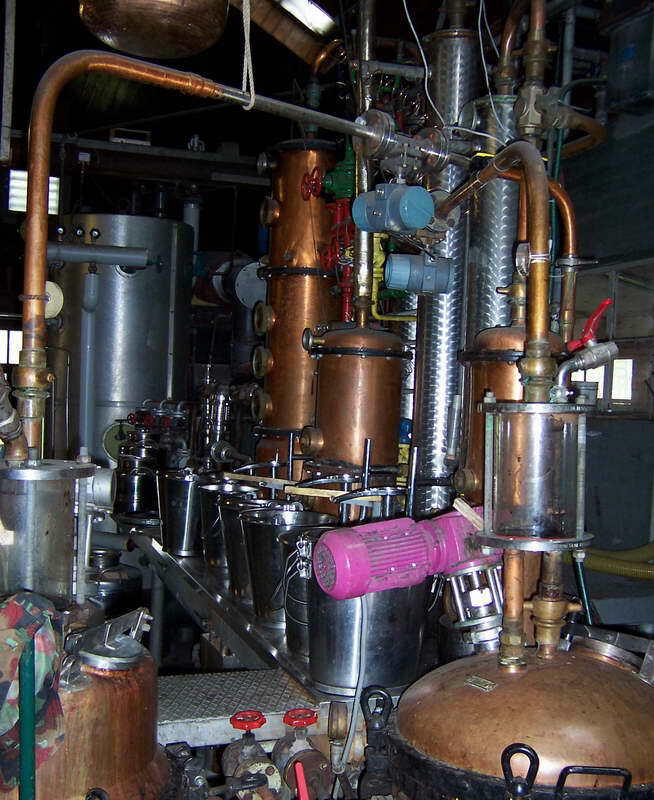 17 - Steve took this photo at our friend Fredu's distillery. 18 - Me and Sherry walking the streets of Bern. 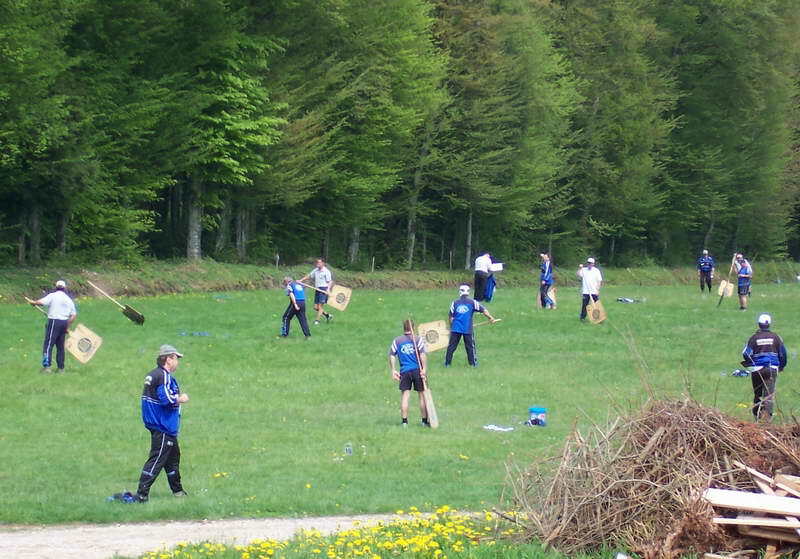 22 - On the first Sunday morning, we went to watch a game of Hornusser in our village. 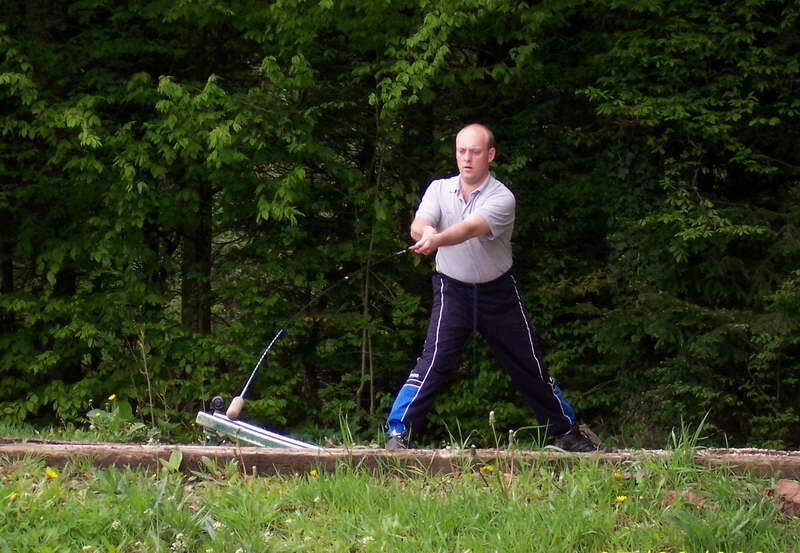 It's a traditional game in our region that they explain as 'farmer golf'. Sherry, Steve and I found it to be a mix between golf and baseball. This guy is the hitter and hits a small puck out into the field at least 100 meters (about 100 yards). 23 - These are the guys that are out in the field waiting for the puck. Somebody has to hit it with their paddle. 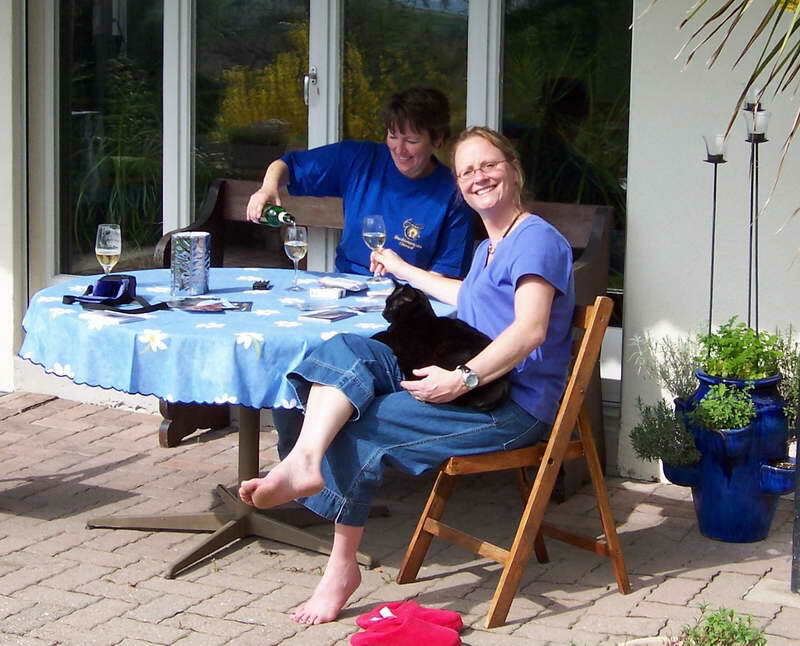 24 - As we watched the game, we drank wine and beer. It didn't seem to matter that it was still morning. We were, after all, at a hornusser game. 25- Steve an Sherry on the Kleine Scheidegg, with the Alps in the background. 26 - Sherry and Steve took a hike up the hill and took this photo of Kleine Scheidegg. 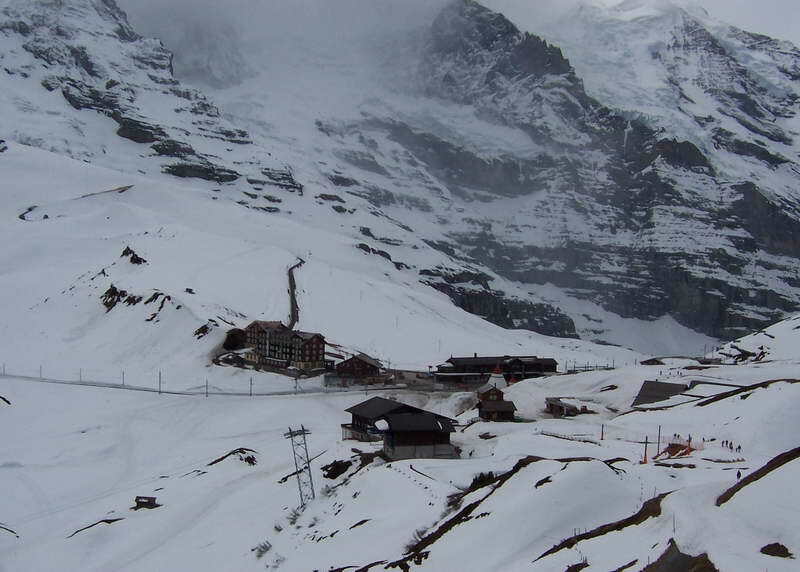 It was covered with snow and the weather was so bad that we couldn't even see the Jungfraujoch. We decided not to pay to take the train any further up the mountain. 27 - This is a photo I took of Kleine Scheidegg when I had gone on a hike with Herbert's father one summer. This is what I had hoped that Sherry and Steve would see. 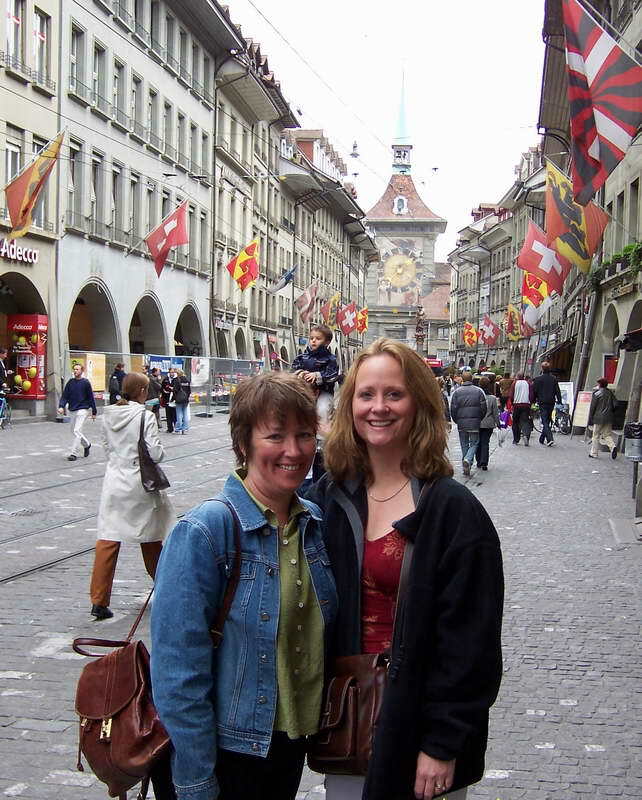 28- The first stop on our road trip to Italy and France was Luzern, Switzerland, which is known for it's Kapellbürcke bridge across the Reuss River. 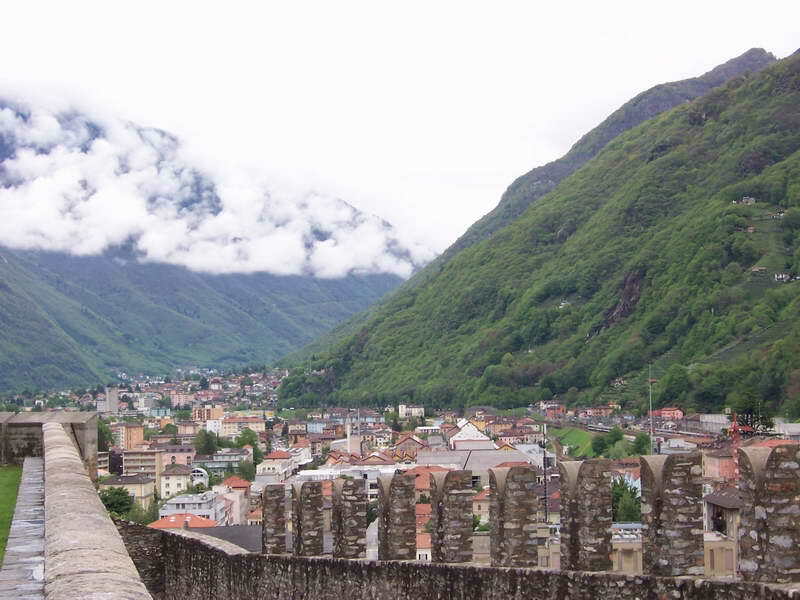 29 - Our next stop was in Bellinzona, in the Italian part of Switzerland. We walked around one of the three old castles and then had lunch. 30 - The first night we stayed in Florence, Italy, which is known for it's uniquely decorated buildings. 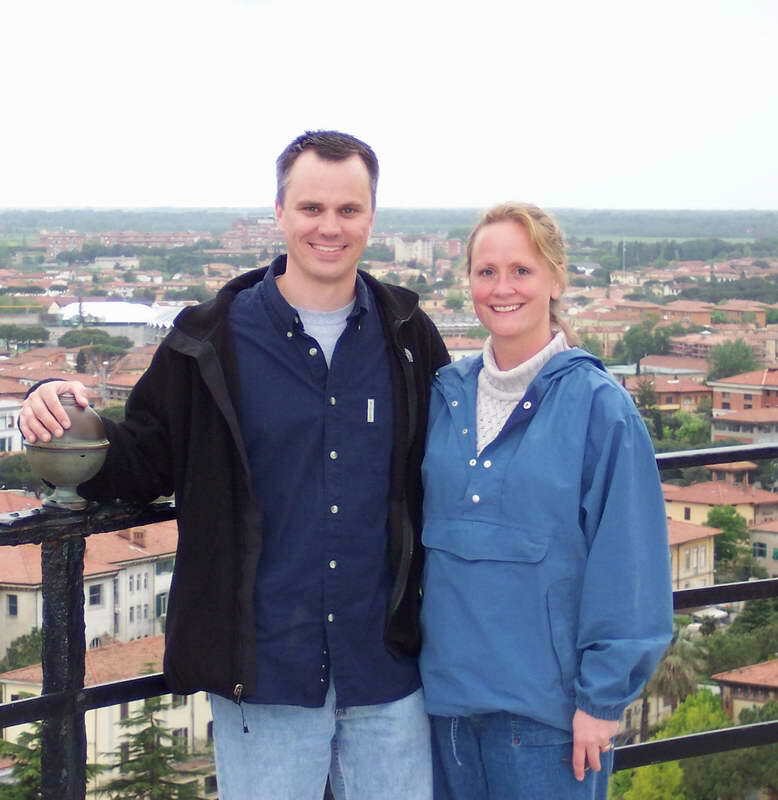 31- Although it was raining, we enjoyed walking around Florence. 32 - I'm sure I don't have to say what this is, but I will... it's the Leaning Tower of Pisa. It was my first time to see it and I found it to be very interesting 33 - Sherry and Steve paid to take the tour of the tower and walked up all of the stairs. When they got to the top, they waved to us and we took their photo. If you click on the photo, look for the two people waving their arms to the left of the bell. 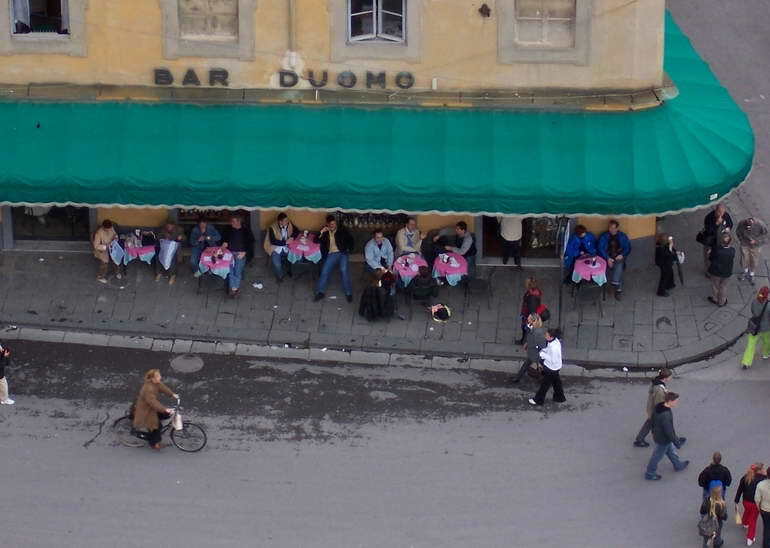 34- They, in turn, took a photo of us waiting and drinking a beer at the cafe below the tower. That's me and Herbert at the second table from the left. 35 - Sherry and Steve had someone take this photo of them when they were on the top. 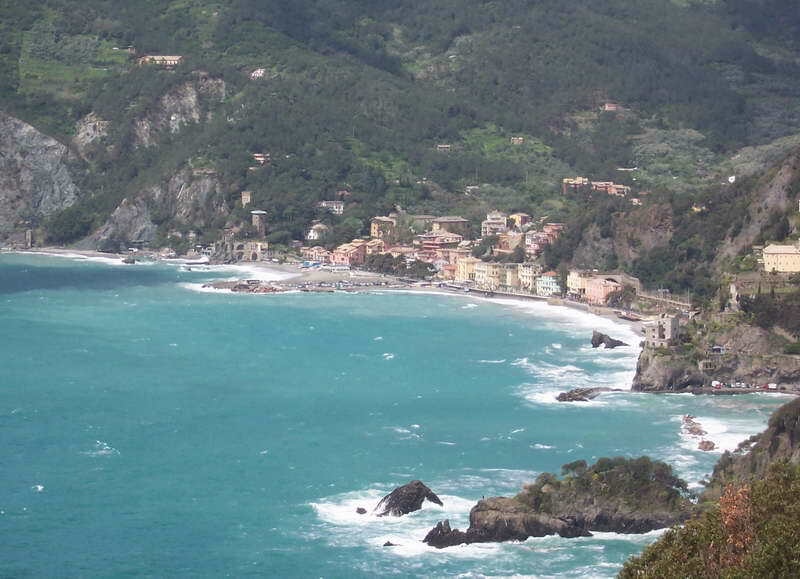 36 - This a view of Cinque Terre. There are five small villages along the cliffs on the Mediterranean Sea. No cars are allowed in most of them and you need to get from one to the next by boat, train or by hiking. 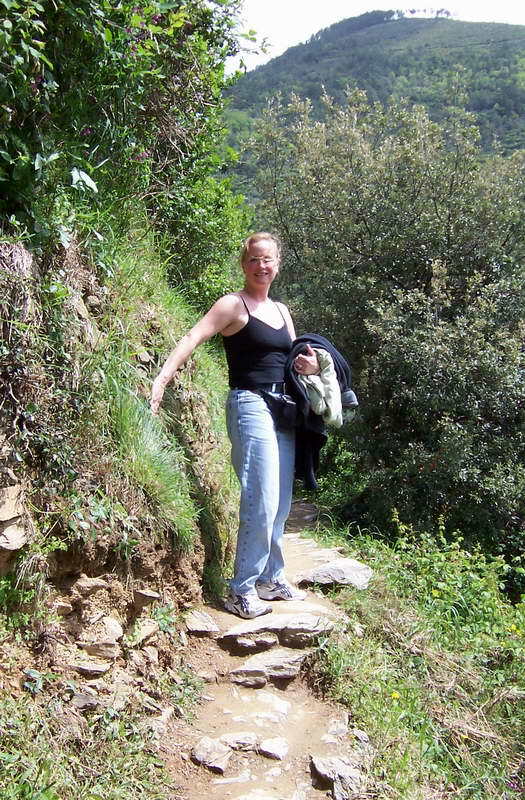 Because Herbert and I had hiked from Monterossa to Vernazza when we had been here on a trip with Ken, we let Sherry and Steve hike alone. 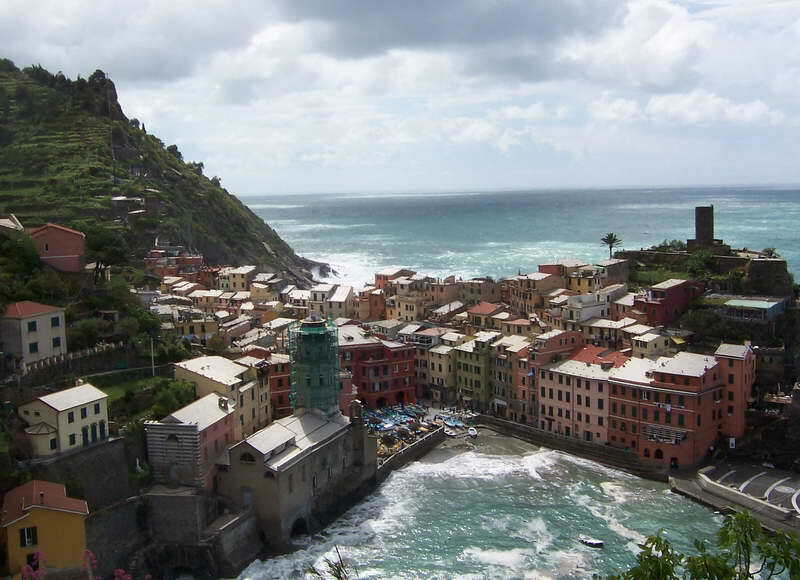 37- This is Vernazza, the village that they started their hike from. 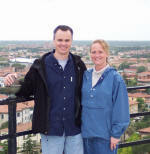 38 - This is Monterossa, the village that they walked to. 39 - Steve along the hike. 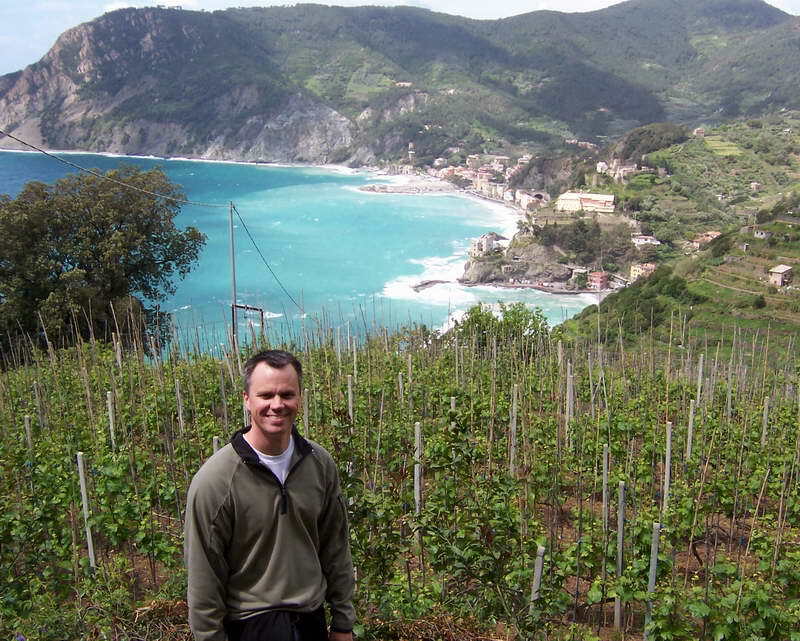 Those are grape vines in the foreground and Monterossa in the distance. 40- The paths along the way are fairly well established, but can be narrow in certain places. Sherry seems to be bracing herself on the narrow, rocky path. 41 - When Herbert and I had stopped for lunch in San Remo, Italy with Ken three years earlier, we took a photo of the owner of this restaurant. I had promised to send him a copy, but had lost his address. I brought the old photo with me on this trip and was determined to deliver it. It took us a while to find it, going on memory alone. Steve took this photo so that we'd always remember the name of it. 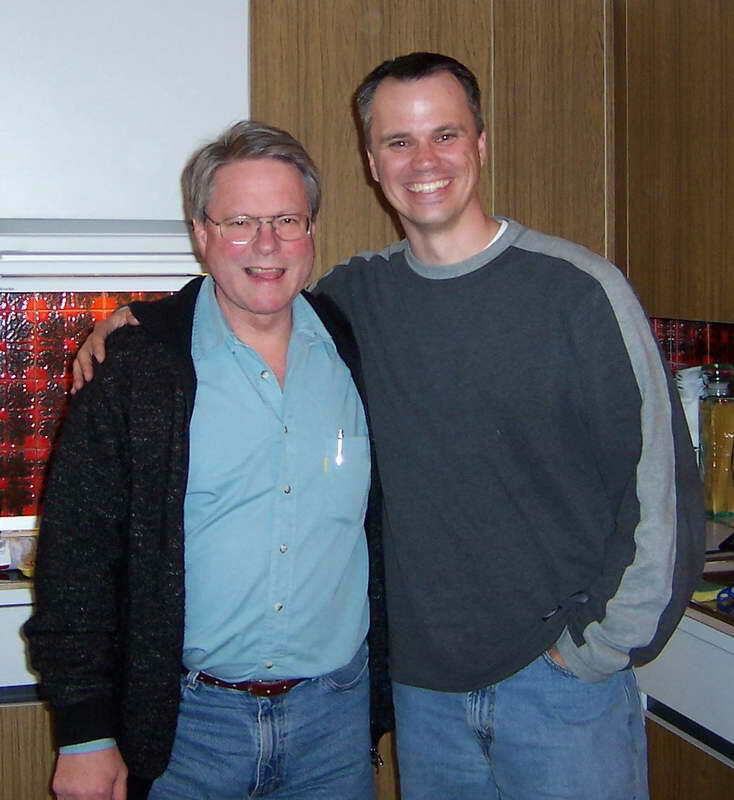 42 - This is a current photo of the guy. When we walked in, he was standing with a bunch of men at the bar. I held the photo out to him and asked if it was him. He said yes, but he looked a little disturbed. Then he asked me where I got the photo. I explained how we had been there three years earlier and that I had promised him a copy of the photo I took. He was completely shocked. 43- We sat down for a beer and the owner took a photo of us, just as he had taken a photo of me, Herbert and Ken on the first trip. He told us that he was overwhelmingly touched that we would bring him the photo. 44 - We moved on into Menton, France and after dinner, we went to see the casino in Monte Carlo. We sat at the outdoor patio and each of us had one beer. We made sure that we enjoyed it after we saw the bill. Each beer was about $12. Sherry kept the receipt for their scrapbook. 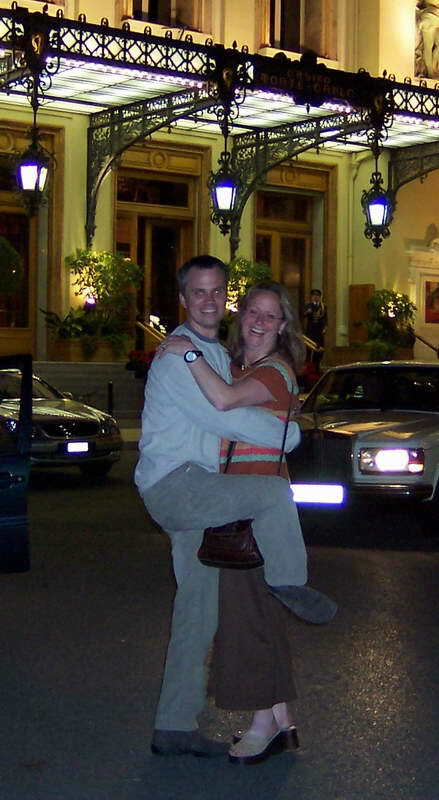 45 - Sherry and Steve goofing around in front of the casino. 46- This is a view or Menton from one of the roads in Monte Carlo. 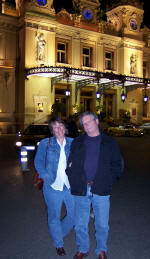 47 - The palace in Monte Carlo. 48 - Everywhere we walked around Monte Carlo, we had to avoid barriers and construction for the Grand Prix car race that would be held in Monte Carlo in a few weeks. 49 - The end of our road trip. A little white wine in Montreux, Switzerland. 50 - On Sherry and Steve's last full day in Switzerland, we had planned to walk for a few hours in the forests that surround Oberwil and then have a BBQ in one of the forest houses. The weather didn't cooperate and instead, we had a BBQ at home with Mädi and her boyfriend Hausi. 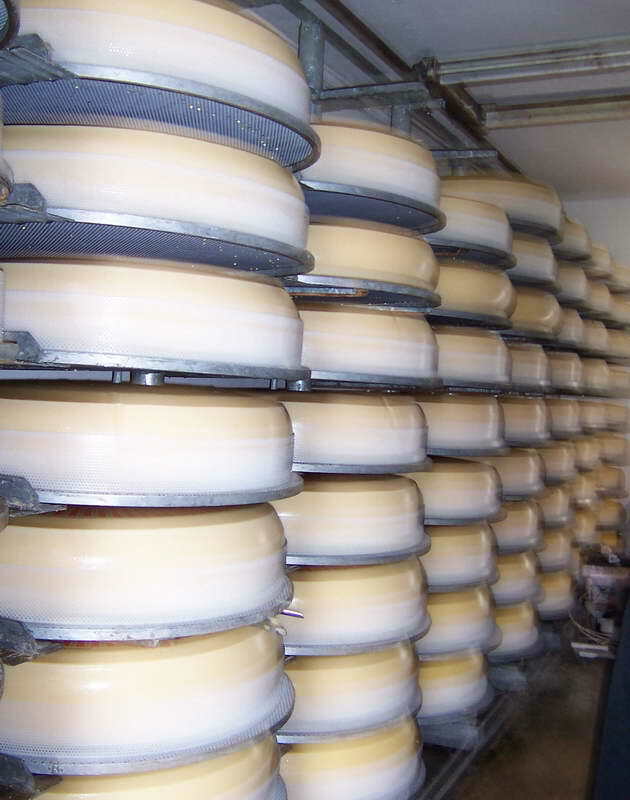 Steve and Sherry thought our cervelats looked strange. 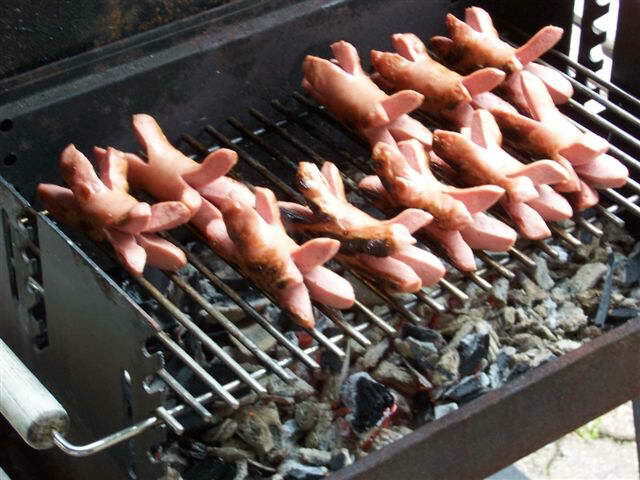 But there really just big hot dogs. 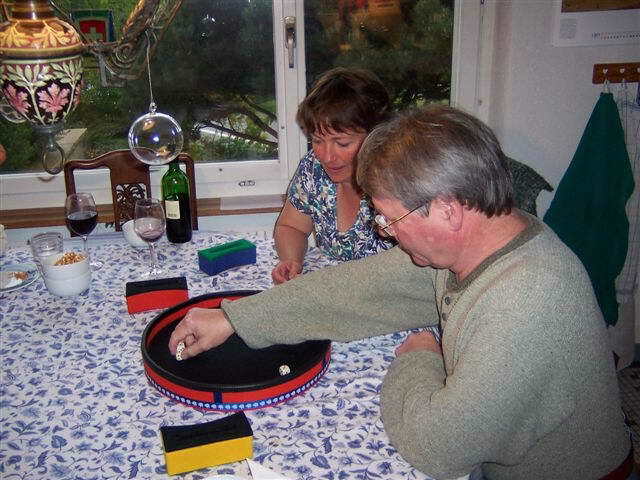 51 - After eating, we taught Sherry and Steve to play the dice game that Mädi had brought with her. 52 - Me, Sherry and Mädi. 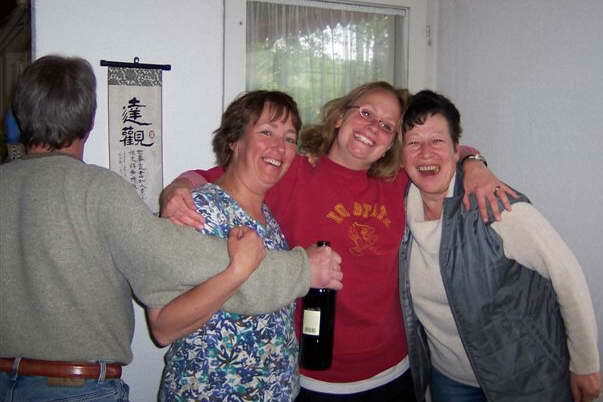 That's Herbert holding up a bottle of wine, thinks he's giving a clue about why we look so happy.